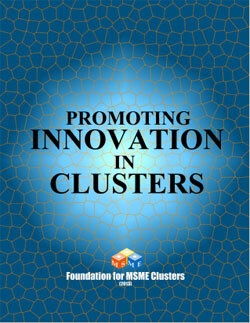 This is a policy guidebook aspires to provide roadmap for cluster practitioners, development organizations, donor institutions and government agencies working towards promoting innovations in MSME clusters. It offers a practical approach and flexible framework for implementing an innovation promotion project in clusters, thus paving way for new frontiers of knowledge to develop innovative clusters. The book is the outcome of learning derived from the project ‘Promoting Innovation Clusters’ implemented by FMC for The National Science & Technology Entrepreneurship Development Board (NSTEDB), Department of Science and Technology, Ministry of Science & Technology, Government of India. This report is an outcome of a study commissioned by Institute of Applied Manpower Research (IAMR) of Planning Commission, Government of India to FMC. The report captured the phenomenon of “jobless growth” and draw policy suggestions, based on the field study of 46 MSME clusters in India. The study outlined major factors that have led to jobless growth and these factors were further analysed with respect to the sectors (industrial/traditional/micro-enterprise) the clusters fell in. Policy suggestions (central and state level) were also derived from the findings of the study and presented in the report. 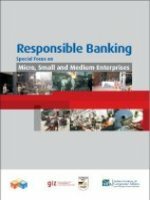 This book provides a snapshot of the role and significance of the financial institutions (FIs) in fostering Business Responsibility (BR), particularly in the context of MSMEs in India, and is in line with the National Voluntary Guidelines on Social, Environmental and Economic Responsibilities of Business released by the Ministry of Corporate Affairs. Responsible banking lays stress on the environmental and social consequences of projects and financial products, rather than just the economic and financial impact. The study was conducted with the objective of understanding the extent and ways in which the international and national FIs foster BR among enterprises through responsible lending and also map international and national BR instruments related to FIs for sustainable lending. This report brings out demand side view points on how to create a suitable enterprise led approach for poverty alleviation and also suggest changes in the policy of schematic support. 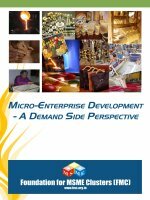 This report is based on a field study undertaken by FMC in 12 poverty intensive locations in India of which 6 have no micro enterprises clusters and another 6 micro enterprise based. This study was funded by UNDP. 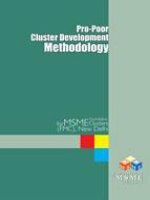 This document sponsored by EDII focuses on methodology of cluster development programme in poverty intensive clusters mostly consists of rural and urban informal clusters where primary stakeholders are mostly in poverty. How to identify the poor stakeholders, understand their problems, needs and prepare appropriate action plan has been explained in the document along with the methodology of implementation of the programme to address poverty.